Frequent bandhs called by various organizations in Assam is adversely affecting lives of the people living near bordering Arunachal Pradesh. 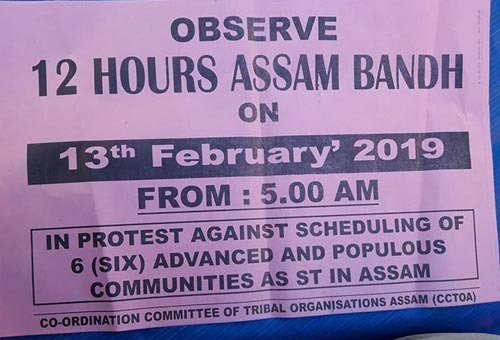 Assam has witnessed successive bandhs for the last two decades almost every day statewide or some part of the State has been under the purview of a bandh. The agitations were intensified on the wake of granting Scheduled Tribe status to six Assamese communities and Citizenship (amendment) bill-2016. Of course, the situation is seemingly developed after the Rajya Sabha (Upper House) was adjourned sine die on Wednesday without having taken up the controversial bills. The frequent bandhs called in Assam on various issues and demands is badly affecting the daily lives of Arunachali people as road communication and transportation of essential commodities between Itanagar and other places are made through the highways in Assam. Eminent citizens of Arunachal Pradesh have expressed their resentment over the unpleasant Assam bandhs. They said that the people of Arunachal, who are unconcerned with the demands have been suffering for years. “Frequent bandh call by various organizations in Assam is a never ending distress for the people of Arunachal. The bandh call cannot justify any genuine cause and the untold sufferings the common people go through during bandhs negate all the genuineness. The protesters should adopt other means of registering protest rather than adopting bandh culture at the slightest pretext”, said Denhang Bosai, Deputy Director of IPR serving in Itanagar. Like Bosai, many Arunachalis are realizing that their people suffering due to bandh call in Assam although they are unconcerned with the issues. “A large number of Arunachali people including students, businessmen and medical patients, who regularly travel to Itanagar and eastern Arunachal districts amidst Assam, have been suffering a lot for it’, the people lamented. As per government report, Assam and other NE states lose in crores during bandhs thereby making the region more backward economically. A statewide bandh call in Assam incurs a total loss of Rs 6,790 lakh per day while the State has recorded 13 similar bandhs in 2018. As per Directorate of Economics and Statistics run under Assam government, the State has incurred loss of Rs 6790 lakh per day due to a statewide bandh call. Notably, the Gauhati High Court has already declared gal all bandhs in Assam and Meghalaya as illegal and said it is violation of the fundamental rights of the citizens. The High Court also directed the Assam Government to take steps for preventing infringement of fundamental rights of the citizens on account of bandhs. The Assam government, following High Court directive had framed a draft Bill to ban bandhs in the state. The draft bill named as ‘The Assam Prohibition and Prevention of Bandh Bill, 2017, is still under the consideration of the Government.